People love to joke about the many ways to pronounce and spell Chanukah (or Hanukkah), the holiday of lights that begins on 25 Kislev and lasts for 8 days. But what does chanukah actually mean? On a basic level, the word chanukah means “inauguration.” Indeed, Chanukah celebrates the inauguration of a newly built altar in the Temple in Jerusalem. ● We find divergent traditions in the Talmud regarding how many candles to light each night of Chanukah. 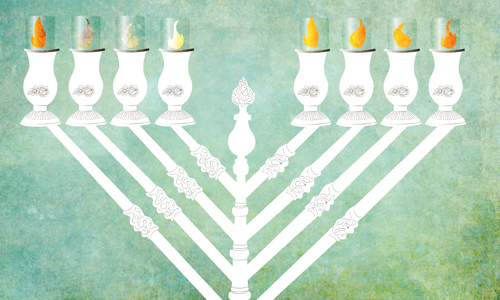 According to Beit Shammai, we start the first night with eight candles and decrease by one candle each night thereafter. According to Beit Hillel, we start the first night with one candle, and each night we add a candle. The accepted halachah follows the teachings of Beit Hillel. Indeed, the Lubavitcher Rebbe often stressed the unique connection between Chanukah and education. Chanukah is a special time to inspire children to connect to their heritage, as can be seen by the many Chanukah customs that specifically involve children, like the giving of Chanukah gelt. Machzor Vitri, 239; Shibolei Haleket 174; see also Maharsha, Chidushei Agadot, Talmud, Shabbat 21a; and Igrot Kodesh, vol. 24, p. 267 in the footnotes. Rabeinu Nissim, Talmud, Shabbat 21a (9b on the Rif); Abudraham, Hilchot Chanukah. Otzar Kol Minhagei Yeshurun, Chanukah. Abudraham, Hilchot Chanukah; Tur, Orech Chaim 670. Chidushei Rabbi Tzvi Elimelech of Dinov, Chanukah, sugya 3. See, for example, Likutei Sichot, vol. 20, p. 632, vol. 25, p. 395; Nitzutzei Ohr, p. 35.